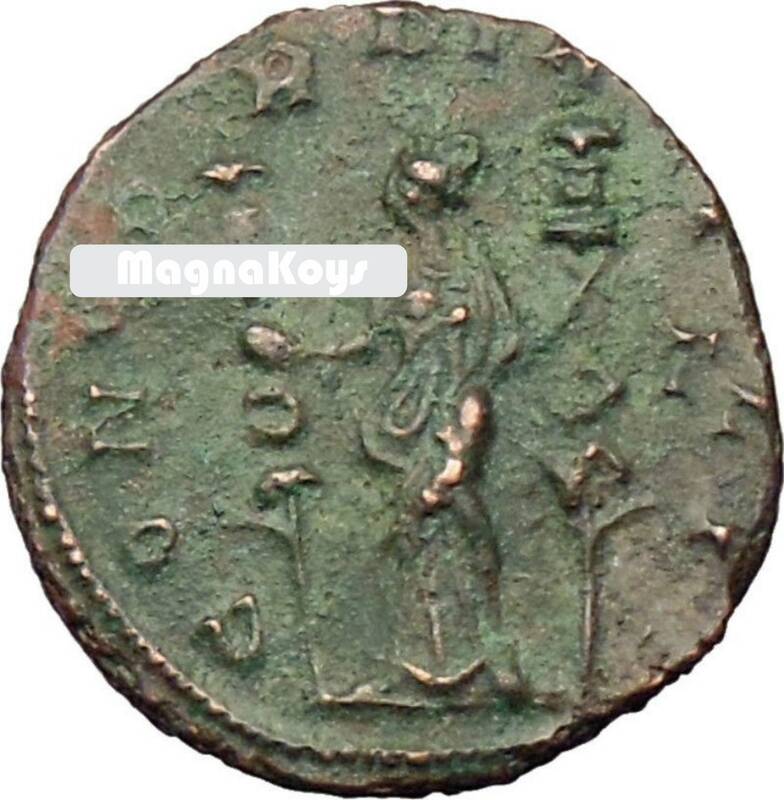 Bronze Antoninianus 20mm (3.53 grams) Struck circa 270-272 A.D.
IMPCAVRELIANVSAVG - Radiate, draped and cuirassed bust right. officina Γ in right field. In Roman religion, Concord (Latin: Concordia, "harmony") was the goddess of agreement, understanding, and marital harmony. Her Greek version is Harmonia, and the Harmonians and some Discordians equate her with Aneris. Her opposite is Discordia (or the Greek Eris).The cult of Concordia Augusta ("Majestic Harmony") was of special importance to the imperial household. Dedicatory inscriptions to her, on behalf of emperors and members of the imperial family, were common. The oldest Temple of Concord, built in 367 BC by Marcus Furius Camillus, stood on the Roman Forum. Other temples and shrines in Rome dedicated to Concordia were largely geographically related to the main temple. Lucius Domitius Aurelianus (September 9, 214 or 215 –September or October 275), known in English as Aurelian, Roman Emperorr (270–275), was the second of several highly successful "soldier-emperors" who helped the Roman Empire regain its power during the latter part of the third century and the beginning of the fourth. During his reign, the Empire was reunited in its entirety, following fifteen years of rebellion, the loss of two-thirds of its territory to break-away empires (the Palmyrene Empire in the east and the Gallic Empire in the west) and devastating barbarian invasions. His successes started the end of the empire's Crisis of the Third Century. 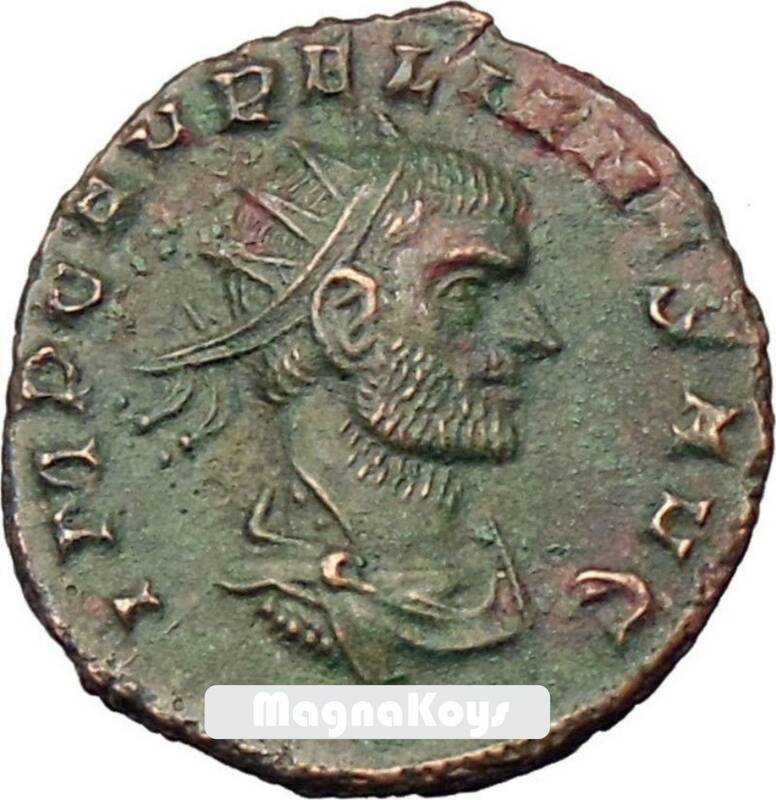 Aurelian was an upwardly-mobile soldier who was eventually appointed commander of the cavalry by Claudius II. With the aid of a sympathetic army he revolted against the accession of Quintillus and a civil war was avoided when the latter committed suicide following the growing popularity of his rival. Aurelian was then hailed as emperor by the Senate and the rest of the legions alike. His first mission was to strengthen the army by the introduction of the strictest reforms and discipline as well as quelling the various uprisings that had broken out over the last two decades. He thus spent the next five years until cut down by his own Praetorian Guard at the height of his glory. It seems Aurelian's personal secretary, after being reprimanded by the emperor for attempted extortion, felt an execution would follow. To guard against this possibility, he concocted a story about Aurelian intending to execute his personal guard and then rushed to share with them this manufactured evidence. Naturally, afraid for their lives, they entered the emperor's quarters and effected a preemptive strike. Somehow or other it was soon afterward found out that the formerly beloved emperor had no such motives and his secretary himself was swiftly executed for treason. When news reached Rome of what had happened Aurelian's wife seems to have actually been left nominally in power while a new emperor was selected, a period that may have lasted several months. Although history is a little hazy in this matter, it would mark the first and only time a Roman empress explicitly ruled the empire.